Sassy Sanctuary: Budding Graphic Designer? I have to admit, I love graphic design and I love messing with HTML code. Now, I am far from an expert but I found that with the help of google I can figure out just about anything and its so rewarding. Well, for all those digi-scrappers out there, The Shabby Princess just released a new free kit and it is SO cute! It was just the inspiration I needed. I had been wanting to re-do my family blog. I had a 3 column layout and hated that I couldn't post very big pictures. I also wanted to figure out how to add a menu bar. Want to see the new look? Want to hear an awesome blogging tip? Now this isn't my original idea and I can't remember where I heard it, but its oh so smart! 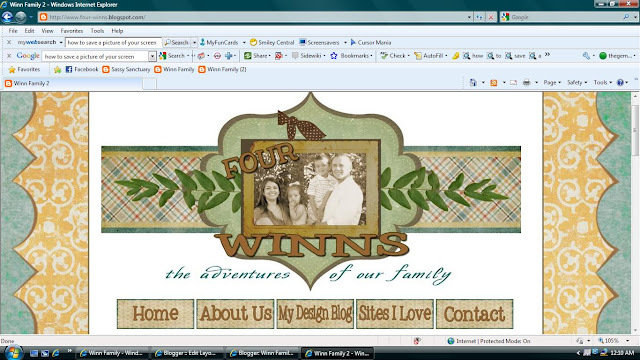 Anyone with a family blogs has to worry about internet security but I never really did. I've never been a paranoid person but when a friend of mine had her five year old apply for a home mortgage, it made me stop and think. She actually shut her blog down because she feared the information the identity thief used came from her blog. I use our names on my blogs, I blog about birthdays, I blog about grandparents. That's scary information in the wrong hands! I didn't want to worry about what I post, so I decided to go private. The problem with private blogs is that you don't have a live feed so your readers don't get an update that you posted. So to combat this you create a second, identical "cover" blog that is public. On this blog all you post is the post title and a link to your private blog's post. This way people can just click, log in, and read. Smart! If you want to check out my cover blog you can visit it HERE.